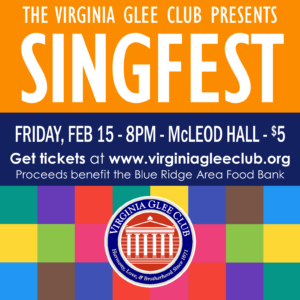 Joined by a long list of UVa’s A-list acappellas, the Virginia Glee Club is proud to host this evening of vocal power and charitable action on Friday, February 15th, 2019, in the McLeod Hall Auditorium, 8:00 pm. Tickets are only $5 and proceeds from this aca-mazing concert go to the Blue Ridge Area Food Bank! Be there to show your support for UVa student vocal groups and to help our community members in need. Online ticket sales are now closed, but we can still fit you in! Tickets will be available at McLeod Hall before the show tonight. Contact publicity@virginiagleeclub.org for more information.